A number of business lobby groups have signed a letter to Theresa May, saying the government needs to “get on with expanding the UK’s airport capacity”. The letter has only been sent, due to Heathrow – and Chris Grayling – lobbying the companies to send it. The same business groups have lobbied many times before, in favour of the 3rd runway. The claim is that, (despite all the financial uncertainties, the fact Heathrow is in the wrong location, and its immensely damaging environmental impacts) the runway will somehow help Britain cope with the problems Brexit will cause. The groups that put their name to the letter were the Confederation of British Industry, the British Chambers of Commerce, the Institute of Directors, the Federation of Small Businesses, the EEF – The Manufacturers’ Organisation, the London Chamber of Commerce and Industry, and airport expansion lobby group London First. The timing of the letter, which has been published by Heathrow, is particularly important, because Heathrow wants the required vote to approve the draft Airports NPS (ie. the Heathrow 3rd runway) to go ahead as planned before September because then MPs will be more pre-occupied with Brexit. Theresa May has been urged to stick to the government’s timetable for having a vote on Heathrow expansion. A number of business lobby groups have signed a letter saying the government needs to “get on with expanding the UK’s airport capacity”. The BBC understands that the idea for the letter came from Heathrow itself. Transport Secretary Chris Grayling has also been asking business groups to support the expansion plans, the BBC has learned. The business organisations that signed the letter have all come out in favour of Heathrow expansion in the past. The letter sent to Number 10 said: “As Brexit approaches, Heathrow expansion is crucial to making sure the UK remains an outward-looking trading nation and is well-equipped to compete on the world stage. The letter adds that the UK is losing ground to competition from European airports. “There are many unknowns for businesses surrounding Britain’s future trading arrangements, but what is absolutely certain is that our economic success depends on securing Heathrow’s future as a leading international airport,” it adds. The groups that put their name to the letter were the Confederation of British Industry, the British Chambers of Commerce, the Institute of Directors, the Federation of Small Businesses, the EEF – The Manufacturers’ Organisation, the London Chamber of Commerce and Industry, and airport expansion lobby group London First. The BBC understands that these organisations were asked by Heathrow to lobby the government collectively via the letter. The timing of the letter, which has been published by Heathrow, is particularly important. The government is due to timetable a vote on the Airports National Policy Statement, which is going to set out its airport infrastructure policy – including Heathrow expansion – in the first half of the year. Heathrow regularly has meetings with the business lobby groups, and its position is that the groups sent the letter out of a mutual desire to get the vote tabled, the BBC understands. It was expected that the vote would happen before the summer recess, which runs from 24 July to 4 September. The business lobby groups and Heathrow want the vote to go ahead as planned before September because then MPs will be more pre-occupied with Brexit. The terms for Britain to leave the EU need to be concluded by 30 September 2018 under a timetable set by the EU’s chief negotiator Michel Barnier. The UK vote on the Airports National Policy Statement will be tabled after a process is set in motion by Transport Secretary Chris Grayling. He in turn has been lobbying business groups for support for the government’s Heathrow expansion plans to try to get MPs to vote in favour. Conservative MPs are likely to vote with the government. Unions and many Labour MPs also support expansion, but the Labour leadership in the past has come out against Heathrow expansion on environmental grounds. The City of London Corporation has taken the opportunity of the Lib Dem Party Conference to urge the party “to not stand in the way of Heathrow expansion”. The Corporation’s policy chair Catherine McGuinness, said: “Increased airport capacity at Heathrow is near the top of the list when we speak to firms about what can do to help them trade more, create jobs and invest for the future.” (Many other surveys of businesses over the years do not show this – but it depends on which firms are sampled). Speaking at the party conference yesterday, Lib Dem leader Vince Cable (a long term opponent of the runway) said: “I want our party to remain where we were, which is opposed to Heathrow expansion, strong on the environment, protective of our climate change obligations, but committed to support business, but in a practical way that rebalances the UK.” The Labour party is also known to be very divided on the issue of Heathrow, with a lot of opposition. Some Labour MPs have been misled by inaccurate forecasts of jobs that the runway might create. Big business tends to stand with its colleague, Heathrow. The CBI wants progress on the runway quickly, and the Institute of Directors said after waiting years, they want to see “spades in the ground” at Heathrow. The Institute of Directors (IOD) are firmly convinced that people should fly more, and so the south east needs more runway capacity. They appear to be entirely convinced by the publicity Heathrow has put out about the alleged benefits a 3rd runway would bring. But they want more than just one runway. The IODs wants the government, after the 8th June election, to build two more runways, and a follow-up Airports Commission be established. They want a fast-track commission be set up immediately to recommend locations for two additional runways within a year. 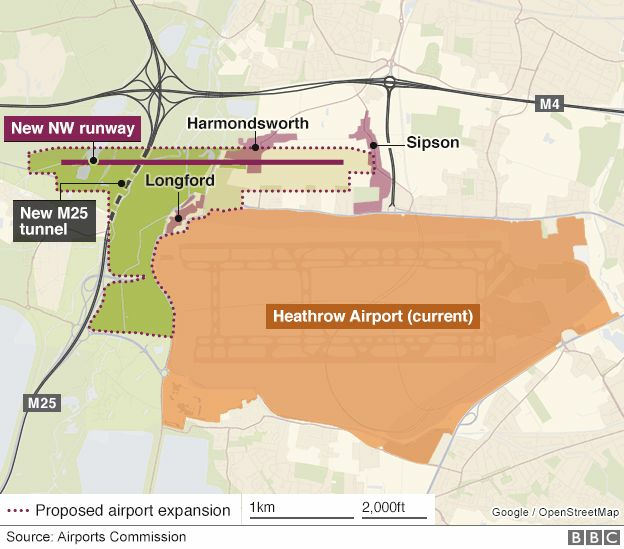 Plans for a 3rd Heathrow runway need the draft National Policy Statement to be voted through parliament, perhaps early in 2018 and then several years of planning process. At the earliest the runway might be in use some time after 2025. Numbers of air passengers are rising quickly, as flying is so cheap and the moderately affluent in the UK get richer. The London Chamber of Commerce and Industry has also called for the next government to enable a 2nd runway at Gatwick to help create a “megacity”. While Gatwick was shortlisted as a candidate for a new runway by the Airports Commission, other airports such as Stansted and Birmingham would be likely to push hard should a future opportunity emerge. More lobbying by big business backers of aviation expansion continues, as the try to persuade the government that everything must be done to expand current capacity, even before the runway they want gets built. They claim this is important for the UK economy, and necessary for the UK to “stay internationally competitive.” Some 52 business people have signed a letter to the Transport Secretary, Patrick McLoughlin, published in the Telegraph (where else ?) putting their demands. They want ministers to act on interim recommendations made by the Airports Commission, such as more Heathrow flights, and improving rail access to Stansted and Gatwick. They want action quickly and presume that adding more runway capacity for more people to take more leisure flights will somehow boost “UK’s global competitiveness”.They also want an independent ombudsman to oversee changes to restrictions on the timing of flights at Heathrow, to try and get over opposition to more flights, and night flights, which is partly what prevents another Heathrow runway. They want more flights, regardless of the impacts on those overflown or living near airports. Posted: Monday, May 28th, 2018. Filed in Blog, General News, News about Airports, Recent News.